Firstly, allow me to thank those who have nominated me for "most thought-provoking blog" over at The Anime Blog Awards, which is no longer a thing, apparently. No, I didn't know there were awards for anime blogs. Apparently there are, or were. For the past forty-odd years, the unstoppable juggernaut of Japanese cartoon merchandise has impacted every corner of the globe. This colorful path of destruction has left many an inexplicable piece of merchandise bobbing in its wake. Which brings us to today's topic of discussion - little toy gliders. This brightly-colored styrofoam glider was found in a dollar store somewhere, and immediately caught the eye of any anime fan in the vicinity. Obviously this is a flying model of the New God Phoenix from Gatchaman II, which is the 1978 sequel to the popular 1972 Tatsunoko anime series The Brave Frog. No, wait, I mean Gatchaman. Anyway, these dinky little stunt glider toys are merely one example of the crazy world of unlicensed toys based on Japanese anime that seeped through the semi-permeable membrane of the Pacific and found their way to toy stores, flea markets, dollar stores, hobby shops, and souvenir stands across America. In future Let's Anime posts we'll be taking a look at all sorts of similar items, but right now it's all about the gliders. As we can see from the handy guide on the back of the package, this series of gliders wasn't limited to Gatchaman sequels, no sir. #1 is of course our Phoenix. #2, however, is from a completely different show from a completely different studio - it's the Comet, from the 1978 Toei series Captain Future , based on the 40s pulp hero created by Edmond Hamilton. 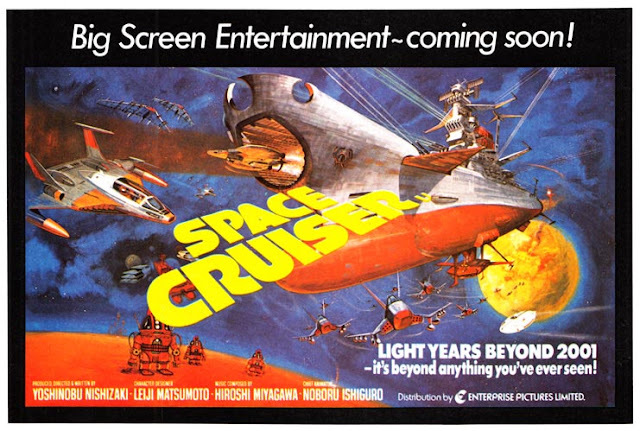 #3 is of course the Cosmos Queen, the super starship from Leiji Matsumoto's matriarchi-riffic retelling of the Monkey King legend, 1978's Starzinger. 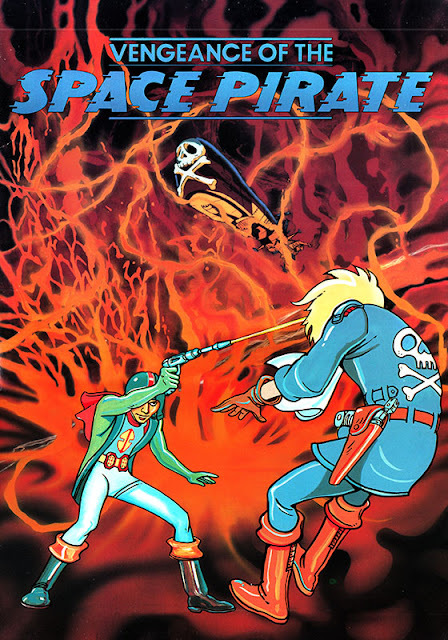 This was shown in the US, retitled "Spaceketeers" as part of Jim Terry's "Force Five" package and features the only space suit designed with a miniskirt. Thank you Leiji. 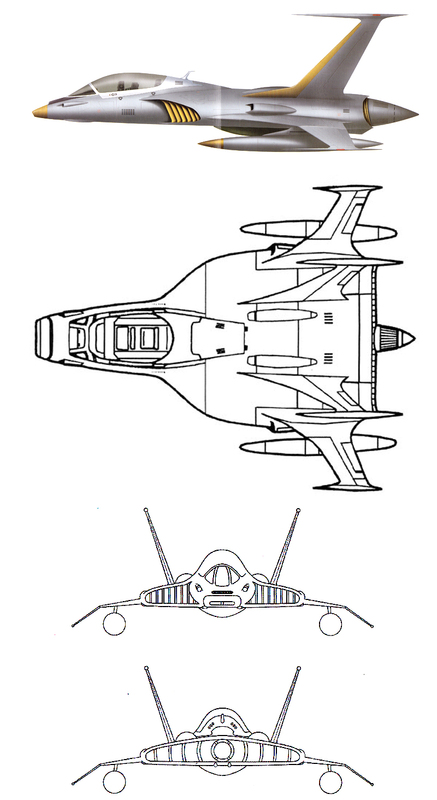 #4 and #5 are reimaginations of the Cosmo Zero and the Cosmo Falcon, both from Space Battleship Yamato. Did they ever make an official model kit of the Cosmo Falcon? This cheap unlicensed glider toy might be your only chance to hold one in your hand! #6 is the G-4 from, again, Gatchaman II, piloted by Jinpei the Swallow. Apologies for the poor image. 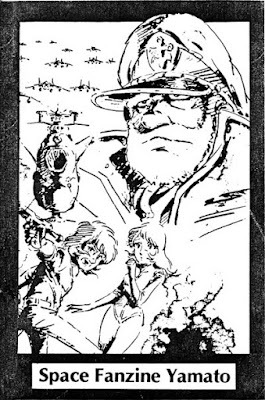 It's a photocopy from a page of the original print version Let's Anime #3, which in turn was a photocopy of a photocopy from a picture that appeared in an aviation hobbyist magazine of unknown provenance. Anyway, it's a model plane version of Nausicaa's "mehve" or "mowe" or however it's spelled, her powered glider/airplane thing as seen in the film Nausicaa Of The Valley Of Wind. Who made it and why is anybody's guess. Here's a closeup of Nausicaa and her little pet fox-squirrel Teto, apparently painted on plywood. Who knows what quasi-legal anime merchandise is hurtling through the heavens above? Keep watching the skies, junior birdmen! guest columnist Steve Harrison tells us how he published the first American fanzine dedicated to a single Japanese animated series! Take it away Steve! 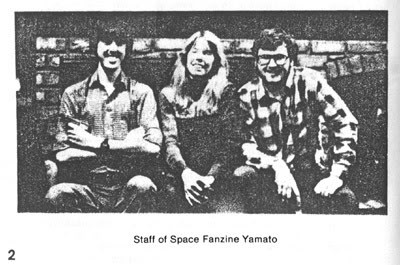 The genesis of Space Fanzine Yamato has its roots in STAR BLAZERS. STAR BLAZERS took over my mind, in a way. 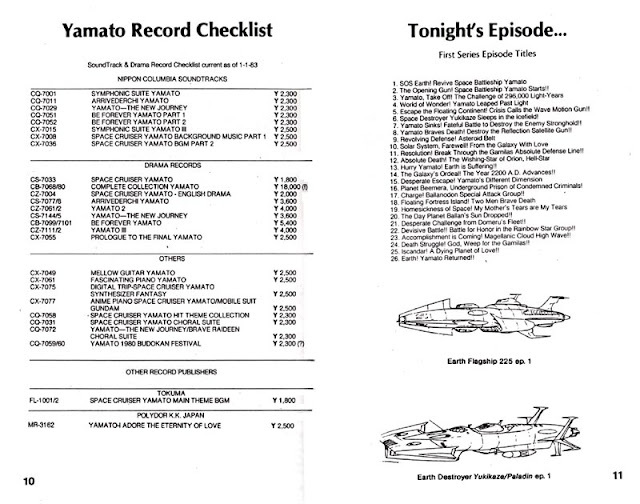 Its early 1980s broadcast was the “catalyst anime” that got me hooked, and thru different means and avenues I started to pick up items from the Japanese “parent” show, SPACE BATTLESHIP YAMATO. 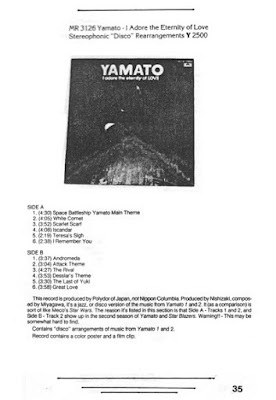 My main focus (mostly due to this being all I could find) was the vast catalog of YAMATO record albums, so those beautiful full color liner notes, those few pictures were my main, my ONLY knowledge of YAMATO. The Drama Albums (LP recordings of actual dialog and music from films and TV) helped, because even without understanding Japanese, one fairly quickly picked out character names. Not that I had any real clue about the correct spelling or anything, and yes, I was aware enough to know that “Jason Kodai” and “Shane O’Toole” (character names used in the international version of the SPACE CRUISER YAMATO movie) had nothing to do with the actual Kodai and Shima. Oh, some of the wacky, utterly mistaken ideas I had looking at those pictures! amusingly inaccurate poster for British theatrical release of "Space Cruiser"
So I was at a convention (an SF/media con, there were no such things as “anime cons” back then) near Detroit, ConFusion I believe, in Jan. ‘82... I had lugged my trusty Sylvania VCR with me in hopes of maybe nabbing some new DR. WHO episodes, maybe show off some STAR BLAZERS to some friends (trying to get more people hooked on the show), and who knows... my Detroit friends implied that at this con there were sometimes some folk who were into that “Japanimation” stuff. So, I also lugged along most of my YAMATO LPs, because I didn’t have any books on the show. I didn’t know there WERE books on the show. So, yeah, in freezing cold Michigan winter weather I’m lugging a 42 pound VCR, a box of tapes and cables and such, and 10 or so pounds of LP records. I was younger, stronger and clearly insane. Well, after a day of doing con stuff, I finally get word that yes, those "Japanimation” folks made it to the con, they were from Canada, and I was introduced to Marg Baskin and her crew. They were polite enough but a tad standoffish, I assume because of my “newbie” status. Seemed STAR BLAZERS and YAMATO wasn’t too interesting to them, except for this one girl whose name I just couldn’t catch (it’s an odd problem. Some people I meet and *snap* I lock the name and the face and no problem. For other people the name just vanishes instantly, even though I WANT to remember. It’s embarrassing). So this young woman was keenly interested in my YAMATO LPs. She was pointing to pictures, saying names, describing history and story points… holy crap, she knew stuff! We spent most of the convention just talking to each other, to the point where we talked for just about 24 hours straight! It started mainly because it was late at night and she was locked out of the room, I had offered her some space to crash in my room (OK, not my room, the room I shared with 6 other fans... man, we were all crazy then) but she was uncomfortable with that and I couldn’t blame her… so we spent all night long wandering the hotel and talking about YAMATO and anime and stuff. Oh what a doofus I was! She wasn’t a Canadian, she was from Michigan! Home in Battle Creek and going to school in Ann Arbor! Boggle and joy! So naturally, broke, jobless, I still cadged a way to get to Chicago, register for the con, pay for my share of the room, and convince my best friend (and only other person in the Star Trek Club of Grand Rapids who was hep to STAR BLAZERS) Jerry Fellows to come with me to meet Ardith and see what Chicago had to offer. 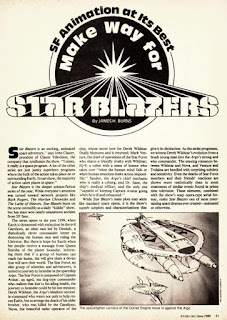 During our time together, Ardith made mention of how she was getting upset with the producer of the Star Blazers Fan Club newsletter. It seemed that the editorial habit was to take Ardith’s carefully constructed reports from Japan (she WAS going to school in Ann Arbor for Journalism, after all) and rewrite them, taking credit for her work, her knowledge. There were articles and reviews that she DID get a byline on, but all the news that the newsletter reported came from her, uncredited, and it bothered her. It takes a typewriter and a photocopy machine, or taking it to a printer if you want it to look really good. There was no magic, no mystery to producing a newsletter or a fanzine, I had done it (well, newsletter, but I knew people who did ‘zines), and I had done similar things in putting on Babelcon, the Grand Rapids media con. It was work, but it was easy work. She was unsure, but grew more interested as I talked. Even there I had coined the name “Space Fanzine Yamato” out of a general giddy session of “naming” stuff (Space Lunchbox Yamato, Space Ice Cream Cone Yamato, etc.). So plans were laid. Ardith would translate whatever she wanted to translate, I would write about things, Jerry would write about things, we’d package it and sell it. Thanks to Ardith I learned about (L.A. anime retailer) Books Nippan, and started to buy Roman Albums and anime magazines. My knowledge slowly grew, the outline of what I wanted to see in Space Fanzine Yamato firmed up, and the format started to gel in my head. I was applying the “George Lucas” philosophy. 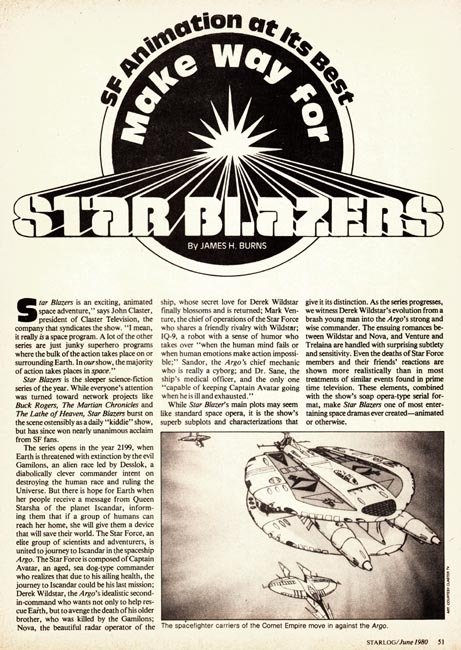 Back in 79 when I got hooked on Star Blazers, what would I have wanted to know? What would I have wanted to buy? I decided to produce the fanzine that I would have wanted then. One of the magical moments was when Ardith told me her friend James was making a trip to Los Angeles and could pick up “Japanimation” items while he was there. From his trip I got the BE FOREVER YAMATO blueprint book- and the final concept locked into place. 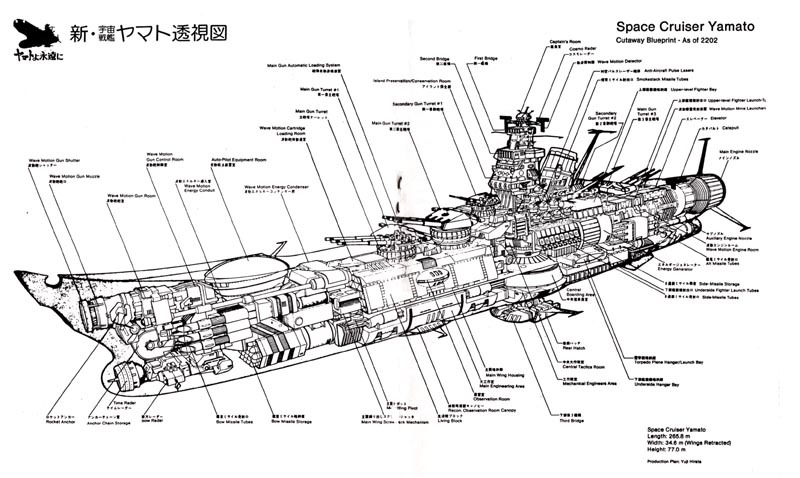 I would include a translated copy of that Yamato cutaway blueprint as a “bonus item”, ala what the Japanese magazines Animage and My Anime were doing. So the slow, grinding agony began. Ardith first produced a flood of work...then as time went on it slowed. I, being a slug, painfully ground out my text. Jerry had finished all his pieces like a week after we discussed it. Time burned on, relationships developed, blossomed, fell apart- oh, there was a hella lot of drama as time went on, much of it totally surprising to me, and I was... not the best person I try to be at times. Finally all the articles and translations were in hand. Lots of money had been spent taking Roman Albums to the copy shop for chara model sheets and other pictures. We had a long session with the 35 mm camera, photographing LP jackets. We took all our text to the typesetter and underwent the painful process of choosing fonts and size and all that stuff (Oh GOD as my WITNESS to have had a Mac and laser printer in 1982! File under “if I knew then what I know now”). I had done paste-up work for my high school newspaper back in ‘76 and spent years producing newsletters, flyers, and program books for the Star Trek club and (Star Trek convention) Babelcon, so I understood the mechanics, but I clearly didn’t have professional tools. No predesigned layout sheets, so I used graph paper. No hot wax machine so I used spray fixative. No Khyron machine for headlines, so anything not done at the typesetter ended up with Letraset and typewriter. The front cover illo came from a “This is Animation” book (and the black border was HELL to dry), the picture on the back was one of Ardith’s black and white photos taken off TV. I was up 'til 1 AM doing the paste-up. I haven’t mentioned advertising yet, or what the deadline was. 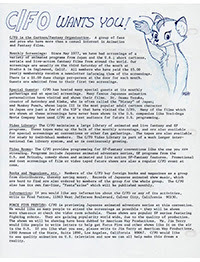 I wanted SFY to come out at the next Capricon, Feb. 1983. I thought it made sense, an anniversary as it were. It was suggested I do the “reservation” thing, take money from people and use that to fund production, then ship when the book came off the presses. I didn’t want to do that. I didn’t want to have to refund money if the project fell apart and I didn’t want to have the debt hanging over my head (moral as well as fiscal). I wanted to have a finished product ready to ship, costs finalized and known. Good thing I did that, because there were a few times it looked like the book wasn’t going to make it. Flyers were created and put out at various conventions, the idea being that if you were interested in SFY you would send me your name and address on a SASE, and when the book was ready I would mail out notices, you’d send money and you’d get your copy. I was quickly buried under replies, over the course of a few months I had like 60 SASEs. My, there’s some interest out there. What were the mechanics of printing Space Fanzine Yamato? I took the paste-ups to the printer. 11 sheets of 8 1/2 x 11, folded to make 44 pages, plus card stock cover. 100 copies, cost (from memory) $130. The Yamato blueprint was 8 1/2 x 14, took that to a different shop with a photocopier that could shoot that size, got a deal of 8 cents per for 100. Typesetting was $80. I didn’t factor in the costs of the film and developing for the LP pictures, the cost of photocopying from the Roman Albums, the cost of any of the books and stuff I had bought or the materials cost for graph paper and fixative. So, production costs: approximately $218 for 100 copies. MSRP of the ‘zine was $3.00. First printing was sold out by March 1983. Not too shabby. Did a second printing due to demand, sold THAT out just as quickly. So, why no SFY issue 2? Ultimately, without Ardith, I couldn’t do it. Not JUST because of her knowledge and translation skills (a significant factor, nonetheless), but because without her I just lost the fire, the “heart” to do it. 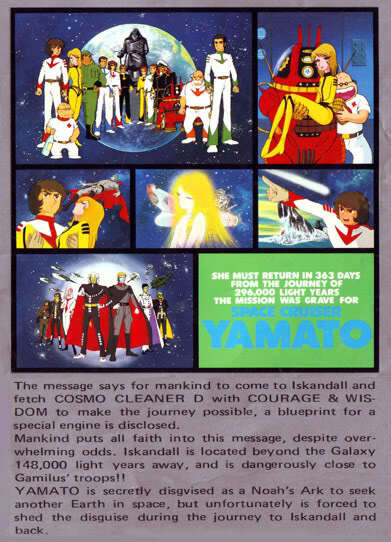 Over the years many have tried to boot me into rebooting the concept, because clearly the idea of a Space Fanzine Yamato is still valid. Jerry even started a website, Space Webzine Yamato, to try and get me going (and he’s done such an excellent job I feel I’d just be a drag on his work at this point.) but that fire is... well… not GONE, but it’s banked, the coals glowing in the back of the bin. Still, for all the pain at the end, I¹m really quite proud of the finished product. Oh, I¹d do some things different now, or course. Just the advent of desktop publishing alone would have totally revamped the production process. The ability to scan in a drawing from a book, be able to scale it, clean it up, flow text around it...*sigh*. Oh yeah, the Offical Bootleg. After the initial two press runs, I was contacted by Derek Wakefield of the Texas Earth Defense Command STAR BLAZERS fan organization. He wanted to know if they could do a print run of SFY for their members. Seems there was a great deal of upset that copies were not available. So I figured as long as it was marked as a reprint, go ahead, it was for a good cause. One of the reasons I agreed was I had heard that someone out there was actually duplicating a copy and selling them for something like $6 each! Good lord, what a bizarre mixed feeling THAT caused! Then there was seeing a copy sitting in a showcase at a comic shop in Battle Creek, in mylar, with a $20 sticker on it. I nearly busted my sides laughing. The face of anime and its fans has changed quite a bit since the '80s. The idea of a dedicated booklet explaining basic things about a series such as character names, episode titles, listings of products released all seems quite quaint, even primitive in today’s world of one click data mining. 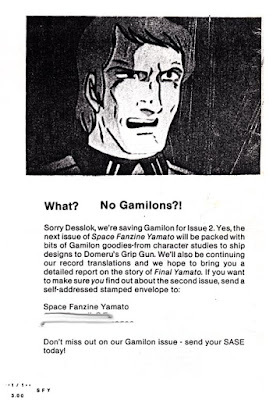 Yet nobody had really done what we did with Space Fanzine Yamato, and that's quite an accomplishment. 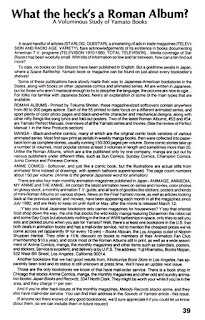 Now in some ways the spirit of the 'zine lives on at Jerry's Space Webzine Yamato and in the growing data tapestry at the official Star Blazers website as overseen by Tim Eldred, and that's a pretty proud legacy. I haven't seen Ardith since...oh, lordy, 1984? She finally managed to achieve her dream of living and working in Japan, and I do hear from her indirectly via a mailing list once in a blue moon. Jerry is still in town and we get together when we can. And every once in a while I do have that voice in the back of my head, saying "hey, let's get the band back together!" It's some of the members of C/FO Atlanta, posing stiffly in a comic book shop, reaching out to their Japanese proto-otaku brethren! Back then we had more hair and were about 20 pounds lighter on average, and we thought nothing of taking a rainy Saturday to drive to the south side and get our picture taken wearing our Lum t-shirts holding MEGAZONE 23 LPs. How did this happen? Well, we had an anime club. In the mid 1980s several things happened at once; I got a driver's licence and a part-time job, by virtue of tagging along with my brother to conventions and SF club meetings I had fandom contacts, and home video equipment was getting cheaper and cheaper. At an Atlanta Fantasy Fair in, let's say 1985, some Florida fans came to town and showed anime movies in their hotel room in the evenings. This set the stage for the next fifteen years of my life, more or less. At an SCA meeting I met up with Scott W. and Albert R., both of whom had an interest in anime. The head of the Dr. Who club had anime tapes along with his British SF shows, and he encouraged our talk of an anime-themed splinter group. We found out a guy named Bill S. had moved to town and was going to start his OWN anime club. 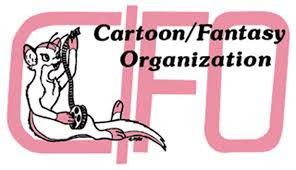 We got together with THAT guy and joined forces and started the Atlanta branch of the Cartoon/Fantasy Organization. By 1986 we were meeting in library community rooms, basements, wherever we could set up a TV and a VCR, showing whatever 10th-generation VHS copies of whatever we could get our hands on - ORGUSS television episodes, YAMATO films, DIRTY PAIR, LAPUTA, LUPIN III, L. GAIM, PROJECT A-KO, VAMPIRE HUNTER D, GALAXY EXPRESS, SAINT SEIYA, URUSEI YATSURA, FIST OF THE NORTH STAR, PRINCE PLANET, ICZER ONE, MOBILE SUIT GUNDAM, CRUSHER JOE, DANCOUGAR, CITY HUNTER, ETERNAL ORBIT SSX, DEVILMAN, AREA 88, ODIN, DAGGER OF KAMUI, LENSMAN, you name it. There would be two or three sets of VCRs in the back of the room copying whatever was available. Dues were ten bucks a year, which sounds like a lot, but we did print and mail a newsletter every month. EVERY MONTH! No wonder I did so poorly in college. Most weekends we'd gather at somebody's apartment and daisy-chain more VCRs and copy anime all night long, marvelling at the artform that was so incredibly awesome and yet so unknown in the United States. Every few months there would be a convention and if the convention didn't give us a room to show anime in, we'd just get a hotel room and show it ourselves. 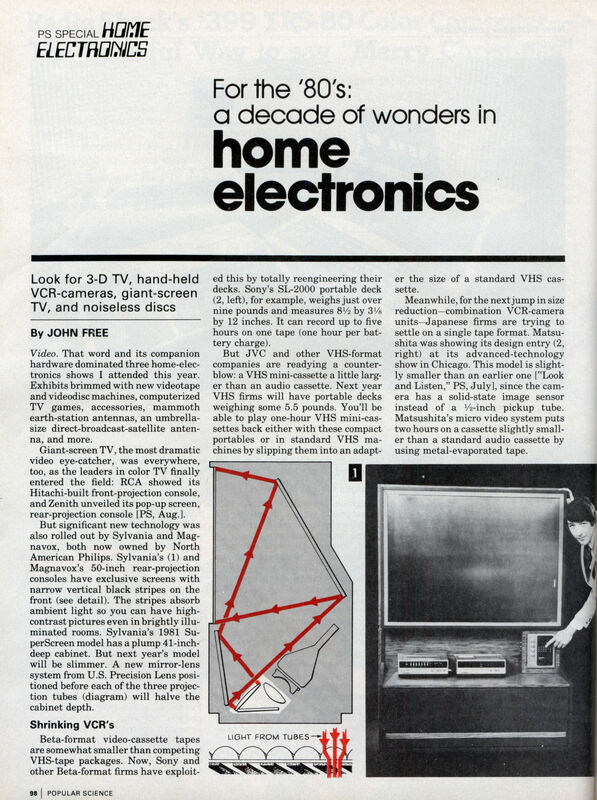 We quickly learned which brands of videotape were the best, which VCRs to choose, how to wire it all up to your stereo to get stereo sound, and how loud you could get before the people next door complained. C/FO Atlanta was a chapter of a national C/FO organization that grew out of Los Angeles and at its peak had chapters throughout the United States, Canada, and even in Japan. By the time we came on the scene the C/FO was beginning to feel the heat from swelling, itching ranks of new anime fans who had seen ROBOTECH on television and wanted more of this "japanimation" thing. The veteran C/FO members were old-school SF fans who were into old-school media fandom - giant fanzines full of fan fiction and pointillist fan artwork, typeset with an IBM Selectric and sold for thirty bucks each. While the new kids had a respect for the fanfic, they wanted tapes, and plenty of 'em. Meetings in Atlanta became daisy-chains of AV cable stringing decks together, fifteen TVs blaring at once, rowdy teenagers grabassing in the back, annoyed librarians kicking us out, and me going home with a stack of 30 blank tapes to copy PROJECT A-KO for everybody. 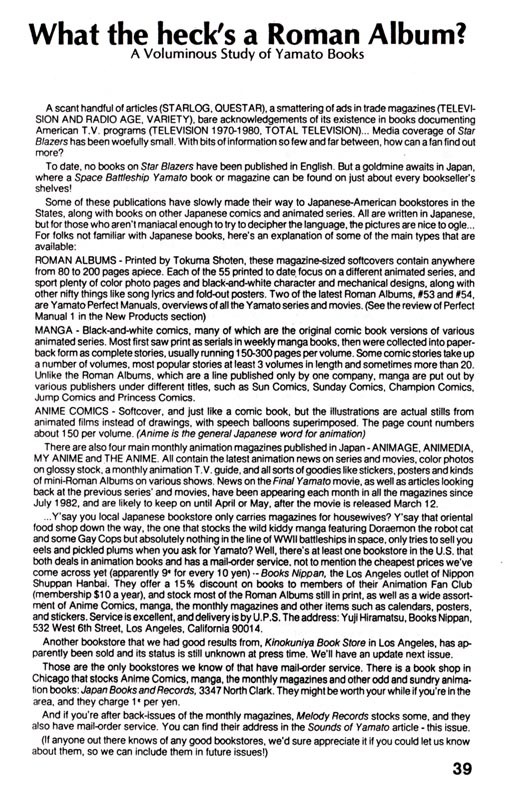 And let me point out that at this point - 1987 - you could not buy Japanese animation on videotape legitimately in the United States. Nobody was releasing subtitled anime. Nobody was putting the things in theaters. 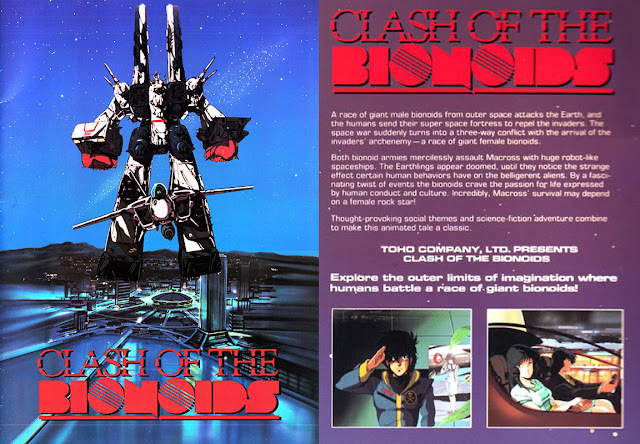 You could watch ROBOTECH on television, which was dubbed (horrors!) and edited (double horrors!) and you could rent dubbed and edited kids' movies in the kids' section of the local video store, and that was it. So if you wanted to watch Japanese animation, you HAD to come to the anime club and bug somebody. (Yes, there were video pirates selling bootlegs of anime in the dealers rooms of conventions, even back then, but we made a point of decrying their conduct in as offensive a fashion as possible). How were WE getting anime? By shelling out for the actual Japanese commercial tapes, by swapping with people through the mail, and by trading tapes with pen pals in Japan. There was a whole network of people mailing each other T-120 videotapes, keeping the Post Office busy. By the time AKIRA came out - I mean, made it to us in America - things had come to a head. The national C/FO Organization was going through a painful and spite-ridden reorganization that would smash its national power forever, and the local club was basically me loading all my tapes and my parents old television into a car and driving across town to show cartoons I didn't care that much about to strangers. I came to the realization that I wasn't getting paid enough for this crap. In fact I wasn't getting paid at all! So I quit. C/FO Atlanta failed to meet the requirements to remain an offical chapter of the actual offical C/FO (not enough members of the national organization) and so, realizing that affiliation with the national org at that point was not worth the proverbial bucket of warm spit, the club changed its name to "Animated Film Association". Most of the other C/FO chapters across the country did the same thing, and the late 1980s were littered with three-initial anime clubs of guys meeting in library basements showing cartoons to each other, like Britons continuing to use Roman law after the Romans went home. By that time I had quit the local club and had started a mail-based organization called the "Prince Planet Foundation" reflecting my personal obsession with Japanese anime and manga of the 60s. I mailed out newsletters when I felt like it and corresponded with people who shared my interests and I amassed a prodigious collection of Prince Planet episodes which I then copied for everybody in the flipping world. Holy cow, did I get sick of Prince Planet. After six or eight months I got together with former C/FO member Lloyd C. and we started a brand new anime club with no newsletters, one-time-only dues, a tape library to prevent me from copying PROJECT A-KO all the time, and a total lack of rules, constitutions, officials, or any of the red-tape BS that so annoyed us with the C/FO. Also I was not going to haul my television any more. This new club - Anime-X - lasted for about ten years and formed the nucleus around which grew Anime Weekend Atlanta, which has lasted for 14 years as of this writing. I still see C/FO Atlanta members at AWA every year and it always astounds us how a club that started out with 5 people in somebody's basement watching a really terrible copy of GUNDAM III somehow became a convention of 10,000 people in a giant convention center. Well, as long as I don't have to haul my TV or copy PROJECT A-KO for anybody, it's all good. Back in the 80s it was business in the front and party in the back - all the time! No film distributor exemplified this wisdom more than Peregrine Films, who released a slate of Japanese anime films just in time to miss out on the anime video explosion. Their marketing strategy was explained in a garishly airbrushed glossy booklet. Peregrine took nine fairly recent anime films, either used the 'international' versions already extant or found somebody to dub them, and released them to home video. Some of these films were odd men out even in Japan, like SPACE WARRIORS. A Toei compilation film of the Ashi television series BALDIOS, this show was mostly known for the usage of a minor character in an internet meme twenty years later. Other titles like TECHNO POLICE had similar weird also-ran or never-were pedigrees. But other Peregrine titles were, shall we say, less forgettable. Like, say, Captain Harlock's feature film MY YOUTH IN ARCADIA. Retitled CLASH OF THE BIONOIDS - a title that guarantees no viewers over the age of 10 - this version of the 1984 MACROSS feature is the 'international' dub that was packaged as a extra on the Japanese laserdisc release. If you've ever watched a bad kung-fu film from the late 70s you will recognize all the voice 'talent'. To date this is the only legitimate version of the MACROSS movie to ever get a United States video release. Where's the justice here? Who will save us? Look up in the sky! It's a bird, it's a plane, it's Locke The Superman! Oh wait, we can't call him "Locke The Superman", because DC Comics will sue us, even though they didn't invent the word "Superman" and the two characters are nothing alike. Let's change it to "Superpower". That'll work. This is another stiff, weirdly accented dub ("esper" is pronounced "esp-aar") of the 1984 Locke film based on the popular SF manga by Yuki Hijiri. A stylish and colorful historical fantasy, KAMUI is about a half-Ainu boy raised as a ninja who finds a treasure and goes to America and meets Mark Twain and falls in love with an Indian princess who's actually French nobility and defeats an evil ninja Buddhist priest against the backdrop of, what was that, the Meiji Restoration? There are hallucinogenic ninja fights and a Siberian husky sidekick and lots of flashing blood everywhere. Of course like most of these film releases, KAMUI would be heavily edited, dubbed badly, and retitled REVENGE OF THE NINJA WARRIOR, which is about as generic a martial arts title as you can find. 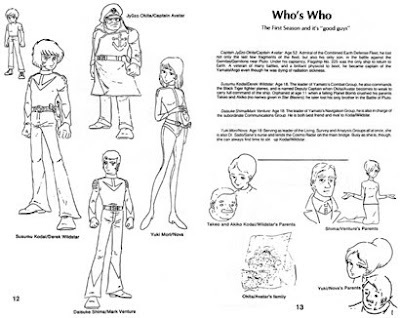 Other Peregrine films included versions of PHOENIX 2772 and CYBORG 009 - LEGEND OF THE SUPER GALAXY. In fact most of these films would get trimmed by about half an hour and released on home video by the "Just For Kids" label. A few years later uncut versions would be released again by "Best Film & Video", some with their original titles. But the real irony is that if this had all happened four or five years later - once a market had been established for direct-to-video releases of uncut, subtitled anime without dumb kiddy titles or crazy dubbing - think of how (to use 80s terminology) AWESOME that would have been! !